Notice the use of a creed here? There really is no escaping tradition. Jeff Stout of Princeton made a similar point in Democracy & Tradition: those who would reject Western-style democracy as antithetical to tradition (particularly, here, Christian tradition) should take note that democracy is itself a tradition and a simplistic rejection for rejection’s sake is ultimately unhelpful. So too, is the knee-jerk and often over-blown reaction against any kind of tradition. My own part of the Christian family just argued about the possibility of online communion. As with so many other fronts in the so-called ‘Worship Wars,’ many took sides based solely on a rejection or embracing of tradition itself. Thus, every attempt to get “beyond” tradition only forms a new one in its place. This is why an increasing number of young adults find ‘contemporary’ worship a vapid experience designed by and for their parents’ generation, and are turning instead to expressions of faith that are more tied to practices and prayers which possess deeper roots. self-aggrandizing revisionism sells books, but it is not ultimately history as such. Thompson points out* several problems with Tickle’s approach: 1) The obsession with numerology is a practice as ancient as it is misleading; 2) Tickle’s theory betrays an inescapably modern, progressive view of history – each sea change every 500 years is seen, as is the current “Emergence” – as on balance being for the better; this telling of the Christian past is not just hopelessly Protestant it is also Eurocentric in the extreme; 3) The “arbitrary” factor: Tickle has chosen events that fit her thesis but ignored major events of the Christian past that do not fit into the 500 year schema. This is my jumping off point for something I’d like to add to the conversation. In essence, my thesis is this: insofar as John Wesley can be identified with the theology, aims, and methods of what is named as “Emergence” Christianity, Tickle’s 500 year theory is all the more thoroughly undone. How does Wesley figure in to the picture? Because Wesley was doing most of these “Emergence-y” things in the middle of the 18th century – smack dab between those magical 500 year cycles. His was a movement connected to the institutional church but also subversive of it. The early Methodists took the gospel to the people before Rauschenbusch ever told the rest of Protestantism to do so. John and Charles Wesley explicitly held together much of what the Christians of their day separated: Scripture and tradition, justification and sanctification, personal and social holiness, “knowledge and vital piety.” (I owe this line of thought to Randy Maddox.) Wesley was fascinated by the science of his day before doing so made you interesting. Methodists emphasized the work of the Spirit like few others besides the Quakers, and re-emphasized the Eucharist at a time when it was not hip among his own Anglican church (the Wesley brothers also embraced mystery when it came to their Eucharistic theology, a move that was much more counter-cultural in its day than it is in our own postmodern context). They insisted that faith was lived in community before community was a buzz word. Wesley couldn’t get a church and so he proclaimed the world his parish. He was both a rebel and a loyal Anglican until the day he died. 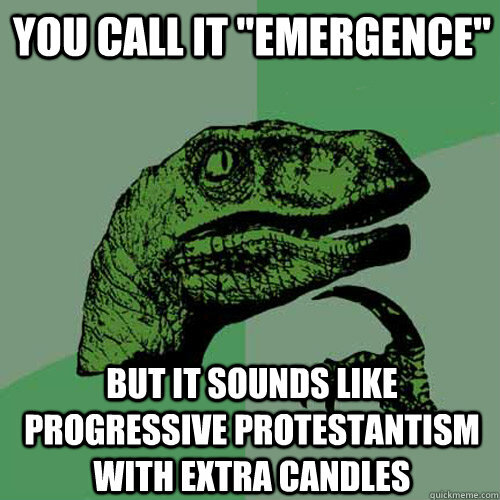 In short, John Wesley was doing most of what Emergence Christianity touts at a time when Phyllis Tickle’s theory says it shouldn’t have happened. I do not claim to be an expert on all things Emergy, but I have read a couple of Tickle’s books. Color me unconvinced. Rather than being the next big phase in Christianity, Emergence Christianity, to me, appears to be little more than liberal Protestantism that has retraced its steps a bit and recovered important pieces of the Christian past. This is, of course, a good thing. I like candles and sacrament as much as the next Christian. But this is nothing new – regardless of how much one cherry-picks the historical narrative to make it look like the next Wittenberg. P.S. I may sound a bit triumphalist about Wesley and the early Methodist movement. I am, of course, a lover of my own tribe, but I do not intend to suggest that Wesley is the end-all and be-all of Christianity. Rather, I present he and his movement as a kind of test case against the historical narrative that Tickle has created. While I respect the breadth of her knowledge, and much of the thought and practice of the movement for which she is a figurehead, I find this telling of history to be too self-serving to be taken seriously. I welcome your feedback about ways in which I have misunderstood Tickle’s argument or Emergence Christianity. *I have attempted to both summarize Thompson’s points and put them into my own words. Something may well have been lost in translation and I encourage you to check out his original, thought-provoking post. To be fair, he says he didn’t mean to be “unkind,” but I’m not sure how asking someone to shut up can ever be done kindly. Of course, his real beef is not with all preachers, but just those who align themselves with right-leaning politics. Strangely, he does not seem to have any issue with Christians who align with left-leaning causes. So while he calls out Billy Graham & Co. for a pseudo-endorsement of Romney, he does not bother to name that the exact same thing happens in the left-leaning churches with their candidates. If Christians were to actually study the Scriptures, which of course most of them do not, and so were to develop their own understanding of the sacred text itself, they would discern between truth and the nonsense that is preached from scores of pulpits in Christian communions across this country. Instead, however, many of them get their beliefs more from the spurious notes of the Scofield Reference Bible, Hal Lindsey’s “Late Great Planet Earth” or the equally spurious B-grade movies they watch as in the “Left Behind” series. A couple of issues. Being a Christian does not mean developing one’s own understanding of the sacred text. That way is madness. That way does not recognize Divine revelation for the whole of God’s people, but a blank canvas to be interpreted to one’s own tune. 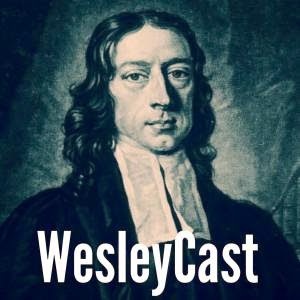 As part of John Wesley’s posse, I recognize that Scripture does not stand alone, but rather as the primary source for truth alongside tradition, experience, and reason. Also, how exactly does one know what is preached in “scores” of churches across the theological spectrum each Sunday? This seems presumptuous. While there is a strong strand of Darbyism/dispensationalism in American Protestantism, it is (despite all the TV exposure) a minority opinion. Roman Catholics, Orthodox christians, and most Mainliners do not subscribe to it. Informed evangelicals do not. I have preached against this kind of eschatology myself, and blogged on it here and here. I actually think the whole notion of the rapture is just as silly as Dr. McSwain does, so perhaps his “shut up” proviso does not apply to me? On the whole, this entire screed seems really to be little more than a cheap shot at the Grahams. They have their flaws, Franklin in particular, but there are much more problematic and influential individuals in American Protestantism at present (here’s looking at you, Mark Driscoll and Joel Osteen). On the whole I like Billy, but to each their own. For now, perhaps we can encourage Dr. McSwain to offer something more constructive to his theological opponents than “shut up.” At the very least, don’t apply your disdain for a few to all of us. Maybe it’s just me, but many religious leaders today seem contradictory, confused and, well, just plain wrong about almost everything over which they wail. True enough, Dr. McSwain. I too loathe much of what is said from certain pulpits. But I’m trying hard to be the solution, and I’m not going to ask your permission to continue doing what God has called me to do. By the by, that thing you said about being “just plain wrong about almost everything over which they wail”? It applies to bloggers as well. Minus bathroom breaks, I read Love Wins in one sitting. I wouldn’t say this is because it is engrossing, but rather because the 200 pages is made up of such short, choppy sentences and large print that it reads more like 100 pages. Compare this, for instance, to the considerably shorter, but much more difficult Nature of Doctrine. Lindbeck’s classic was one of the densest tomes I’ve read; Bell, while a good read, feels unnaturally inflated to me. But I suppose no one would be willing to part with $20+ for a hundred page hardback. 1) Bell is not saying anything new. He’s upfront about this. These issues have been wrestled with since the origin of the faith. Why is this book so controversial, then? Honestly, I’m not entirely sure. Resurgent Calvinism, so common in low-church Protestantism today, will despise this book. Anyone who likes to draw really clear and easy distinctions about the saved and the damned will not be happy with his reflections. Many of these folks didn’t like Bell to start with, as evidenced by the fact that he was being condemned as a universalist before the book was even released. I find it laughable that churches who subscribe to no official creeds, no Magisterium (an official compendium of teaching, like in the Roman Catholic faith), who lack any formal denomination or structure from which to excommunicate someone have still attempted to erase Bell’s name from the evangelicals’ Book of Life. Perhaps such folks are not so Protestant as they imagine themselves to be. 2) Bell has an astounding gift for communication. He is, no doubt, a smart guy, but that’s not what makes his work so impressive. His gift is communicating complicated ideas in ways that are engaging and attractive. I got to see him speak at Duke last year and I was floored. As a pastor, watching him made me feel like I was watching Mickey Mantle while I was still stuck learning t-ball. This is not a book that should be evaluated as if it were systematic theology; it’s not. It’s a book of meditations and questions, none of which are original. He is no Luther or Barth; he’s not dropping a theological bomb. He’s restating some old questions for a new generation in a way that is profoundly helpful. 3) This is solid, practical, and whimsical theology. At various points I laughed out loud and was tempted to cry. He goes between exegesis, stories, poetry, and theology with the nimbleness of a ballerina. If you haven’t read much in the areas of soteriology, the question of other religions, or the nature and scope of Christ’s grace, you may find a lot here that is difficult. For instance, the Bible knows nothing of oft-repeated concepts such as “the age of accountability” and a “personal relationship with Jesus.” Bell may well burst your bubble – but you’ll thank him for it. Given the actual density of the book, I think it’s fair to say it is overpriced (at least if you pay full price for it). The total page count is, frankly, bloated beyond necessity. He doesn’t cite his sources. There is a brief list of acknowledgments at the end, which is helpful. To his credit, he lists N.T. Wright (probably enough reason, right there, to earn the disdain of the John Piper fanboys). His view is heavily influenced by C.S. Lewis’ The Great Divorce, which he does mention. But there is a lot that isn’t credited. At one point, for instance, he references “gospels of sin management,” which I’m pretty sure is a direct allusion to a chapter in Dallas Willard’s wonderful The Divine Conspiracy. But no reference is made of Willard or the book, even in the acknowledgments. I have heard it said that source citations scare publishers because they scare away potential readers, so perhaps this was not Bell’s choice. Read this. Share it with friends, especially friends who have been exposed to a Jesus that doesn’t look anything like the Jesus of the gospels. I wish this book had been available to me when I was journeying from fundamentalism to Jesus; it would have been profoundly helpful. As is, it was a fun read, something I heartily recommend, and something I will use as a reference and source for inspiration. If you like it, do yourself a favor: read The Great Divorce. If you are really feeling froggy, go on to read Hans Urs Von Balthasar’s Dare We Hope?, which asked these exact questions, in a more direct and controversial way, decades ago. I personally found C.S. Lewis and Balthasar much more engaging, but Love Wins is a much easier read than these and a great introduction to the notion that maybe – just maybe – God gets what God wants…everybody. P.S. I said MAYBE. Don’t try to burn me at the stake. Ask a typical Protestant what “church discipline” means, and you will probably get a blank stare. “Are you talking about keeping the youth in line on a mission trip?” they might ask. No. Most Protestants probably will not know the word “excommunication.” In our age of worshipping the individual conscience, Protestants have (contra the New Testament witness) abandoned any real sense of church discipline. This is both an overreaction reaching back to Reformation criticisms and a capitulation to modernity. As Professor O’Donovan narrates it, “the Enlightment swept away church discipline from all but sectarian Protestant communities.” Unfortunately, the laxity with which Protestants treat church discipline at all levels, but especially at the level of laity, seems to be present in Roman Catholic treatments of scandalous priests. Of course, discipline applies not only to lay persons but also to clergy. Unfortonately, all churches tend to approach disciplining the ordained as if they are walking through molasses. On one level, this is not surprising: all systems will protect its own, and the closer you are to power within the system, the more likely you are to be protected. All the various Church communions, on some level, simply protect their own. This seems to have, in some Catholic dioceses, gotten out of hand. I think that the whole narrative of “those sexless old white men need to marry so they will stop molesting children” is overplayed and viciously simplistic. Likewise, I do not think the corruption goes all the way to the top, though it is natural to want “the buck” to stop with the Pope. O’Donovan, both in Resurrection and Moral Order and in his magisterial Desire of the Nations, has a vested interest in the public witness of the Church. In the case of Church discipline, he sees the major turning point as “the fateful exchange of public penance for private.” Thus, all discipline was rendered a matter of the penitent’s spiritual good, and the need of the community to exhibit an unblemished face was forgotten. In his schema, it seems, any priests facing church discipline would and should do so publicly, sparing their own private interests for the sake of the Church’s witness. I think speeches like this precipitate a lot of young people going off to fundamentalist-oriented colleges and seminaries instead of risking exposure to ideas and people different than those with whom they are raised. Not that I see no value in Christian education. I am the product of a great deal of such (pricey) education. For me, the scary thought is being born into, raised, and educated solely within a fundamentalist environment. I have dear friends – great people – who spent all of their childhood and adolescence within a fundamentalist Baptist milieu and then went off to a college that would do nothing but reinforce all of their stereotypes. I find this sad. As for education “taking your Jesus”…well, there is probably an element of truth to that. I think it is a vastly overblown narrative in evangelical circles, but there is a kernel of real experience there. Many secular departments of religion are filled with people for whom Christianity is a mere intellectual excercise, a field of study devoid of personal content or value. Or, even worse, you find people like Bart Ehrman: ex-fundamentalists who seem to relish challenging the fragile worldviews of undergrads who strongly believe in a faith that they do not know is a house of cards. This is the equivalent of Dan Gable wrestling 8th-graders. The difference between a Bart Ehrman doing that and a Christian mentor doing so is analogous to the difference between a stabbing and a surgery: one uses a knife, the other a scalpel. One’s intent is to destroy, the other is to help. It makes all the difference in the world. I am continually thankful to my own mentors who guided me, sometimes kicking and screaming, from fundamentalism to Christianity. 1. Adapted from a version of “the speech” that I received from various folks upon learning that I was going to seminary at Duke. None of them, of course, had the theological acumen to realize the irony of this. Now I can go back and tell them, proudly, “I am so anti-liberal that I am postliberal!” Of course, this is funny only to a bookish elite. Props to George Lindbeck! I am continuously astounded that many on the far right – which has a large contingent of fundamentalist Christians – have been more than willing to overlook Glenn Beck’s Mormonism because they like his brand of low-brow, popcorn-density “journalism.” I think that his particular blend of civil religion – one that confuses any reference to “God” to an endorsement of the Father, Son, and Holy Spirit and cannot distinguish enlightenment Deism from orthodox Christianity – is so vague than many of these Christians on the right honestly can’t tell he’s coming from a different place from them theologically. The Church of Jesus Christ of Latter-day Saints, the Mormon Church, believes Christianity fell into apostasy when the original apostles died. Joseph Smith, founder of the Mormon Church, believes he was called by God to restore the gospel that Jesus taught but had been radically changed by second generation Christians and those who came after. I don’t agree with Webster on all points, but he makes some interesting arguments that I have not seen elsewhere. Webster also points out that, while Beck is vague on his own theological proclivities, he isn’t shy about attacking the details of others’ faith. He’s expressed discomfort with Obama’s brand of Christianity (hey, props for calling Obama Christian!) due to its affinities with liberation theology, which he calls “socialist.” And to an extent, he’s right. Where he is wrong is finding any expressions of a strong faith in Obama’s policies. It may be there, to the President, at least. But Obama’s not really talking about it; whether because it’s not there, or he’s trying to distance himself from Bush, his outspoken evangelical predecessor, is not really possible to know. Beck has made too much hay out of something he knows little about. In his piece, Webster argues that Beck is channeling Joseph Smith moreso than Martin Luther King, Jr. And so far as that comparison goes, he’s spot on. But Smith wasn’t really a restorationist; he wasn’t restoring an existing church, he was making a new one. The LDS church is a creation of his own mind, which I think makes him equal parts huckster and genius. Like Smith, Beck isn’t really trying to restore anything so much as create something that never existed and in the process garner a great deal of attention, wives, money, and power: a pristine, just, and prosperous America that is simultaneously the sole superpower and completely God-fearing (though,significantly, the question ‘whose God?’ is never asked). I think that makes Glenn Beck more like the Pied Piper of legend. A man playing a flute, making pleasant noises, leading us away like children…on a journey to nowhere. I don’t know if there are purple hearts in the study of theology, but in helping some of you to avoid this atrocious book, I hope you can see that I am jumping on a grenade on your behalf. I’ve never read anything that made me want to throw things, weep, and laugh all in such short succession. There is, in this chapter, an astounding gap: nowhere does Lindsey endeavor to explain what will become off all the other religions of the world and their practitioners. One can only assume that he either thinks there will be no more Buddhists, Hindus, Sikhs, and Muslims at this time, or else he puts all of them in league with the hippie kids dancing in the forest. At any rate, it is a major flaw in his argument. Not that the argument itself is strong to begin with, of course. There is obviously a free-church bent here, insofar as the target is very clearly Mainline Protestantism (that is, all the major denominations such as Methodists, Lutherans, Episcopalians, and Presbyterians). He also has a very stunted ecclessiology, simply saying that the “true church…includes all believers in Christ.” (116) I wonder if he would include Mormons in that list? Jehovah’s Witnesses? If the only criteria is “believing in Jesus,” understood in a purely intellectual and consensual way, then he really has a broader definition of church than he should be comfortable with. I suppose it was too much to hope, at a minimum, for something like Luther’s definition of true Word and sacraments. At this point, I can only suggest that you find a bottle of Advil, take two – with water – and perhaps look into some blood pressure medication. If you’re anything like me, you’re now infuriated. In the unlikely circumstance that you care about Jesus but aren’t infuriated by Lindsey’s sentiments, then go read John 17 and reconsider. *I take this to mean that they don’t use big words at Dallas Theological Seminary, Lindsey’s alma mater. **Oh, c’mon. I don’t need to say anything here, do I? You know why this was stupid. Can a pastor commit adultery with culture? A British Methodist pastor plans to tweet Holy Communion to his flock. Social media, as Steve Thorngate points out, has its uses. But this is ridiculous. Pastors get defrocked for adultery, theft, and all other manner of crimes against civic order. What about crimes against Church? Abuse of the sacrament? Can culture be considered a mistress? This is offensive on a number of levels, least of all its fundamental misunderstanding of the nature of the sacrament itself. And he’s a Methodist! Evangelical though he was, John Wesley would not stoop to the level of compromising the dignity and beauty of the sacrament to “reach” people. May God make us all Catholic or Orthodox if we keep abusing His Church in this manner. And tell me, would the man who penned these words condone such an abuse of the Eucharist? As our bodies are strengthened by bread and wine, so are our souls by these tokens of the body and blood of Christ. This is the food of our souls: This gives strength to perform our duty, and leads us on to perfection. If, therefore, we have any regard for the plain command of Christ, if we desire the pardon of our sins, if we wish for strength to believe, to love and obey God, then we should neglect no opportunity of receiving the Lord’s Supper; then we must never turn our backs on the feast which our Lord has prepared for us. We must neglect no occasion which the good providence of God affords us for this purpose. This is the true rule: So often are we to receive as God gives us opportunity. Whoever, therefore, does not receive, but goes from the holy table, when all things are prepared, either does not understand his duty, or does not care for the dying command of his Saviour, the forgiveness of his sins, the strengthening of his soul, and the refreshing it with the hope of glory. Many who become theologians in our time think their task is to try to determine how much of what has passed for Christianity they still need to believe and yet still be able to think of themselves as Christians. This is from Stanley Hauerwas, writing about the response to his memoir, Hannah’s Child. I have a bit of a love-hate feeling for Hauerwas; on probably 80% of things involving the church and the thought of the church (theology), I greatly agree with and admire him. But that last 20% includes much of what he is most vocal about: particularly on the just war tradition, pacifism, and the “Constantinianism” of the church and/or theology. I find I dislike Hauerwas most when he is being distinctively Hauerwas (probably why I most enjoy his The Cross-Shattered Christ). Nevertheless, I thought the above quote was a gem. And he is more correct than I care to think about; too much of what passes for theology involves finding a lowest common denominator for the designation “Christian” in order to be culturally or philosophically acceptable. Here’s looking at you, John Shelby Spong. (Feel free to insert your own name of a quasi-theologian here).